Geographic areas not currently served by pipeline or distribution infrastructure are looking at ways to gain access to the fuel - and increasingly opting for portable delivery systems, often referred to as a "virtual pipeline." In this process, compressed natural gas (CNG) or LNG can be delivered via truck to serve institutional or industrial sites. The gas is transported via a trailer that also can serve to offload the gas into the facility. This application is proving of interest in areas of New England, New York and the Maritimes of Canada where natural gas pipeline infrastructure has yet to reach. The natural gas can be sourced from the local gas distribution utility. Customers include paper mills, medical facilities, and farm/food processing. 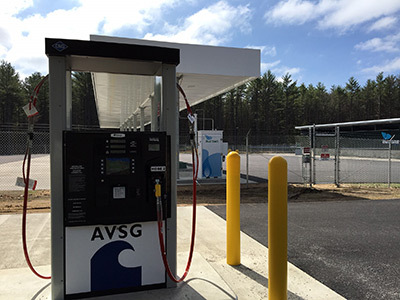 iNATGAS opened this station in December 2016 in NH in a partnership with Liberty Utilities. It has a public fueling station for CNG vehicles, and also a series of bays for trailers to be filled with CNG for commercial customer use. 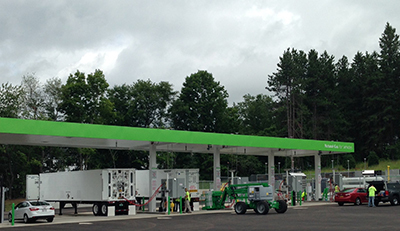 Clean Energy opened this station in NH in 2014. It provides compressed natural gas (CNG) to fuel trucks and other vehicles. It also provides CNG for special CNG tractor trailers operated by NG Advantage that serve industrial and commercial customers, such as a medical center and a paper mill.